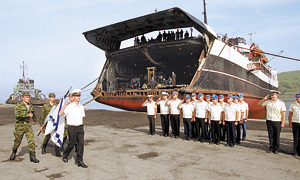 This entry was posted in Force Structure, Navy, Rear Services and tagged 922nd PMTO, Aleksandr Khramchikhin, Cam Ranh Bay, Leonid Ivashov, Material-Technical Support Base, Mikhail Nenashev, PMTO, Proyekt 636, Vietnam, Viktor Kravchenko, Vladimir Komoyedov. Bookmark the permalink. The advantage of bases around the place can not be over emphasised. It is not anything to do with spreading ideology, but simply commercial… if you are sending ships from Russia to the Indian ocean for example then it means when they need replenishment or rest for the crew, it either means sailing all the way back to the pacific fleet base or the cost of going through the Suez canal. Having bases in Syria for the Mediterranean and Vietnam for the Pacific fleet will save money and increase time on station for the vessels of the Russian Navy in their appropriate areas. The cost of rent can be paid in military equipment… the Russian military has enormous stores of tanks and armoured vehicles they don’t need… a minor upgrade to meet their respective needs and gift them to Syria and Vietnam and solve two problems at once. Of course it is important that the gifted material is both useful and wanted by the receiving country so that it is not just a case of Russia dumping rubbish.